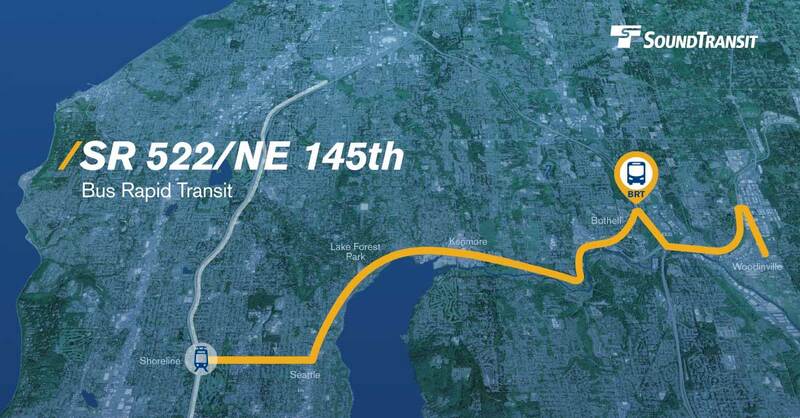 Sound Transit will hold two public drop-in sessions this week about SR 522/NE 145th Street Bus Rapid Transit (BRT), scheduled to begin operating in 2024. The SR 522/NE 145th BRT will provide fast, frequent and reliable transit service connecting communities from Shoreline to Woodinville via NE 145th Street and SR 522. The route has nine BRT stations and new parking planned in Lake Forest Park, Kenmore and Bothell. It will connect to Link light rail at the Shoreline South/145th Station and to I-405 BRT in Bothell. Communities are invited to see how the project's station and parking locations are developing. Sound Transit used community feedback received last fall to help further refine the project to prepare it for design and construction. The drop-in sessions are also an opportunity to learn about how BRT service could change traffic lane configurations along SR 522 and NE 145th St.
Those who aren’t able to attend an in-person meeting can provide comments through an online open house. The online open house will be open through February 11. During 2018, Sound Transit evaluated refinements to the representative project approved by voters in 2016 based on technical analysis and stakeholder input. In March 2019, Sound Transit will present the preliminary refined project to the Board of Directors and begin conceptual engineering and environmental review. Construction will begin in 2023, with service anticipated to start in 2024.